Leverage our Virtual Procurement Team to manage the competitive bid process, negotiate with suppliers and deliver superiors solutions while driving bottom line savings. We are your agile, virtual procurement team here when you need us. We work with you to develop a sourcing strategy, manage the competitive process and negotiate with suppliers on your behalf. We assess your current prices against benchmarks and lead the negotiations to deliver the best overall solution at market competitive prices. Our Contract Management as a Service (CMaaS) is a secure, easy to access contracts portal. We setup alerts for you to manage your contracts or we lead the renewal process for you. No more forgotten or expired contracts! Fully hosted service, so no software to buy. Hire us for an hour, per project, per contract, on call, on retainer when and how you need us. Free initial assessment of your company’s third party spend, bench marked against market competitive prices. No risk! 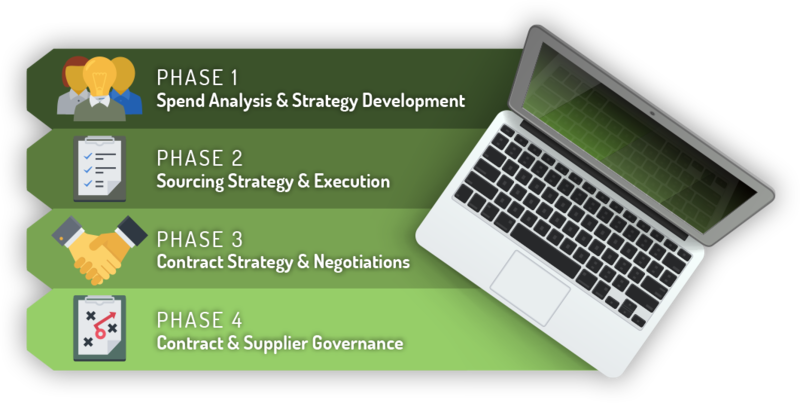 We recommend and help implement supplier and contract governance to ensure you get what you paid for.